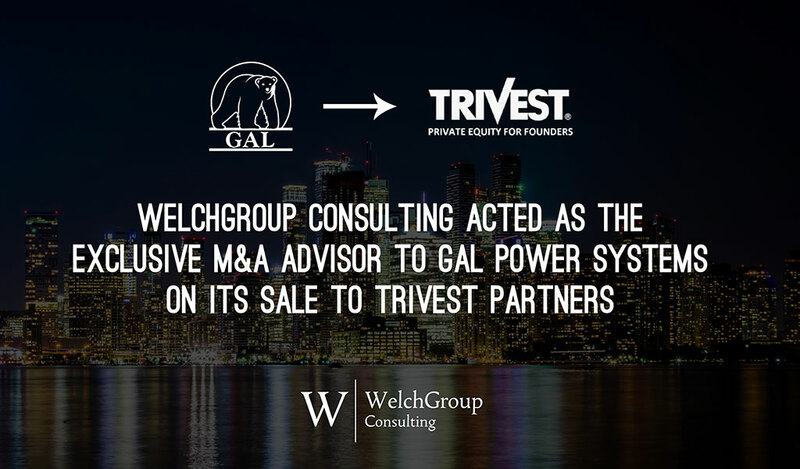 WelchGroup Consulting Announces the Recapitalization and Sale of GAL Power Systems Ltd. to Florida-based Private Equity Firm, Trivest Partners. WelchGroup Consulting (“WelchGroup”), a subsidiary of Welch LLP, is pleased to announce that it acted as the exclusive M&A Advisor to GAL Power Systems (“GAL Power”), an Ottawa-based leader in providing critical power and temperature control solutions in North America, on its sale to Florida-based Private Equity firm, Trivest Partners (“Trivest”). GAL Power, led by its founder, Guy Lapierre, has had great success in growing and building the business organically over the past 33 years. Trivest’s acquisition and recapitalization of GAL Power will help the company accelerate its growth, further its expansion into the U.S. and assist in seeking additional acquisition targets as they expand their market share within North America. “I am truly looking forward to the next chapter of GAL’s continuing evolution and am very excited at the prospect of building a strong and productive relationship with Trivest. Together, I am confident that there are no limitations to what we can achieve. I would like to extend my sincere thanks to WelchGroup Consulting, who have been instrumental in bringing about and securing this partnership,” said Guy Lapierre, Founder and CEO of GAL Power. GAL Power is one of Canada’s leading critical power and climate control solutions provider. Since it was founded in 1985, GAL has become a leader in its market by consistently providing high performance power generators, rental generators, and climate control equipment across Canada and internationally. For more information, visit www.galpower.com. Trivest is a Florida-based private equity firm specializing in mid-market corporate acquisitions and recapitalizations. For more information, visit www.trivest.com. WelchGroup is a leading corporate finance and mergers & acquisitions advisory firm helping entrepreneurs build and capture value in their businesses. Our team of transaction professionals assists mid-market companies execute transactions by providing top tier advisory services. For more information on WelchGroup, please contact Stephan May at smay@w-group.com or visit https://w-group.com.